Both the beginner and the experienced artist can now enjoy the fun and excitement of creating professional quality, permanently etched designs to decorate and personalize glassware and mirrors. 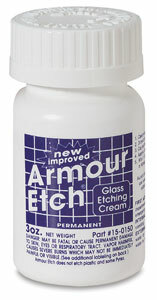 Caution —Armour Etch contains hydroflouric acid, which is corrosive to skin and irritating if inhaled. Use with adequate ventilation, and wear protective gloves. Not for use by children. 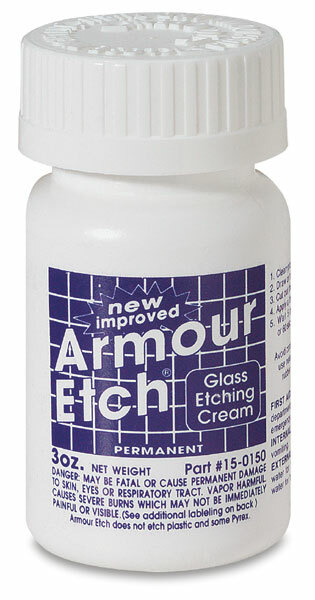 Armour Etch Kit — This kit contains etching cream, cleaner, a hobby knife, an applicator brush, plastic reusable gloves, vinyl masking, designs, and instructions. Designs provided in kit may vary.